Police have condemned a group of people who ignored a safety cordon so they could sit on the edge of the cliffs at Beachy Head. 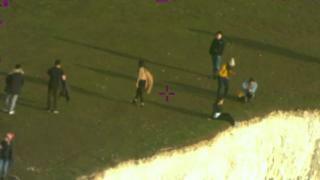 They were photographed by a member of the National Police Air Service (NPAS) who was flying over the Sussex coast. Officers tweeted: "It is incredibly dangerous. You don't know what you are sitting over." There have been repeated warnings in recent years as chunks of the cliff have broken away. But the NPAS said the people photographed near the cliff edge - at least one dangling her feet over the edge - on Sunday were inside a fenced-off section of the cliff top. NPAS South East assistant operations director Russ Woolford said: "It is an incredibly dangerous area and we would urge people to not take such risks." Last October a section of the cliffs was sealed off after a giant crack appeared close to the edge at Seaford Head - following the latest in a series of rock falls along the cliffs, which are more than 150m high in places. In January 2018, photographer David Burr told the BBC people were ignorant of the dangers and were often shocked when he showed them photographs of rock falls. A student fell to her death at nearby Seven Sisters in June 2017 while posing for a photograph there.